This blanket is designed to be a handy companion for all your outdoor adventures. One day you're stretched out on a sunny beach. The next you're enjoying the beat of your favorite festival. 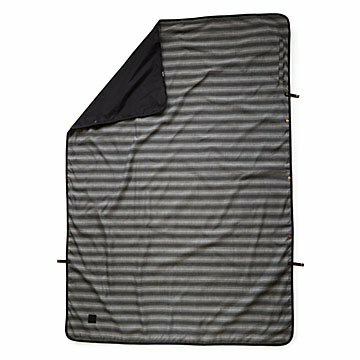 Whatever your next adventure, this handy, enhanced blanket in black or green stripes has got you covered. Combining a top layer of repurposed nylon flannel with a bottom layer of upcycled ripstop nylon, it marries the water resistance of a tarp with the warm comfort of a lightweight throw. These tough materials also mean that dirt, water, and sand disperse with a shake before you pack it up for your next outing. A clever, zippered pouch along the side lets you stow valuables and pack the blanket into itself to double as a pillow. The 4 x 6 foot blanket even includes a hood and connectable snaps for emergency poncho use if bad weather rolls in. Choose black or green. Lifetime warranty. Made in China. Comfortable and soft. Seems durable and easy to use. Seemije it should be a good spring/fall item. Only wish it came in more than black and green. Very unique product, can't wait to use this! Great all around blanket. Sturdy and compacts well. Would be nice to use traveling and would pack well into suitcase. My boyfriend loves this blanket it's so much lighter in his backpack when we hike.